How's the Real Estate Market Right Now? The Real Estate Market has been on quite ride over the past 3-4 years, especially here in Columbus, OH. Local area home values have risen dramatically during that stretch, creating the epitome of a Seller’s Market like we haven’t seen in quite some time. But what’s happening right now? Are things still on fire? Or are we starting to see a cool down? I grabbed my camera for March’s installment of my video series #FirstMondays to discuss. Why Are Home Values So High Right Now? 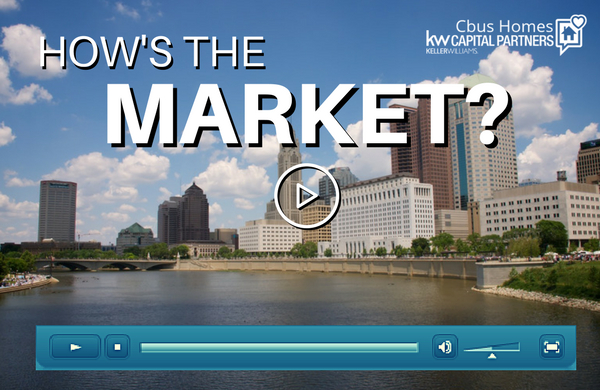 Home values in Columbus have risen dramatically in recent years because of the simple principle of Supply and Demand. There has been such a low inventory that prospective Buyers have become backlogged, creating a “housing feeding frenzy” every time a home hits the market. Here, supply is the number of Sellers’ homes on the market and demand is made up by the number of Buyers looking for a home. Because the demand far outweighs the supply right now, meaning there are many more Buyers than there are Sellers in this market, those Buyers are at the mercy of the Sellers’ terms and conditions during negotiations, leading to rising prices and much more favorable terms for Sellers in most instances. Experts, including myself back in December’s #FirstMondays video, have been warning that the real estate market is eventually going to shift. At no time in history has the real estate market been able to support an exponentially growing Sellers’ Market such as this for too long. Eventually, rising prices are going to come back to Earth. Now, this doesn’t necessarily mean that price are going to fall. And it most certainly doesn’t mean that we’ll see a market crash like we did back around 2008/2009. But more than likely, sooner rather than later, we’re going to see the market catch up to itself, even out in regards to the number of Sellers and Buyers in the market, creating a more even market. So, while real estate technology and online services like Zillow, Trulia, and Redfin continue to grow, and then the real estate market evens itself out, some things are going to fundamentally change as it pertains to real estate. The need for an expert Realtor is going to increase dramatically. In this Sellers’ Market, there are almost as many licensed Realtors in Central Ohio as there are listings for sale in Central Ohio. What?! That’s insane. Everyone seems to know a Realtor right now, and the truth is, that Realtor doesn’t need to be an amazing salesperson… master negotiator… marketing extraordinaire. If a house is priced well and in good condition, it’s going to sell, no matter who the Realtor is. But when the market shifts, all of these licensed Realtors who have been selling houses without doing anything to help that sale are going to be in BIG TROUBLE. How are they going to set themselves apart from the experts? They won’t. How are they going to market their listings to sell? They won’t. How are they going to educate their clients and help them with their housing needs? They won’t. They won’t do any of this because they don’t know how. But guess what? I do. And I can’t wait to set myself apart, sell my clients’ homes better than my competition, and educate my clients similarly to what I’m doing here. Get ready, Columbus. Because when the real estate market shifts, I’ll be ready to continue earning your business while many others will be spinning their wheels wondering what’s happening.